Hey Listen! – Why I think Ocarina of Time is the best game ever. I’ll start by getting this out of the way. 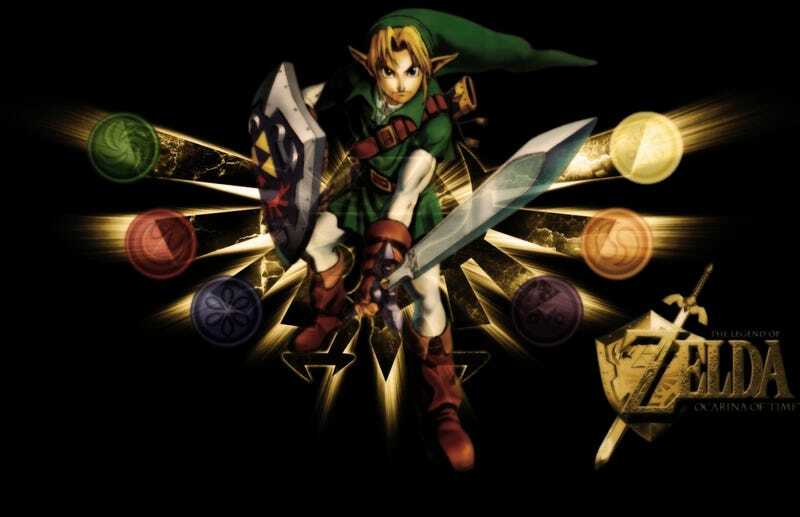 Is The Legend of Zelda, the Ocarina of Time the best game ever made? Yes, yes it is! Why? Reasons! Loads and loads of reasons! It’s Monday my fellow TAYers, and I am in a stupidly good mood. I know, freakin’ weird, right? But things have been going along fine lately, and I am happier than usual so I thought about writing something, my first game non-review but something…, and as I am old and not that much into some of the new games that are in the market I thought it was best to review my favorite game The Ocarina of Time. A timeless classic for so many reasons that it still holds up as one of the best games ever (the best for me) almost 20 years after it came out originally. How did it come to us? Produced by Shigeru Miyamoto, and designed by him, Yoichi Yamada, Eiji Aonuma and Yoshiaki Koizumi, The Legend of Zelda: Ocarina of Time (OoT), came out in the last months of 1998 across the world for the great, late N64, and it was the bomb! No, really! It was like a Farore, Din and Nayru had blessed the humans with a gift of excellence and perfection. And I am still grateful for that. And the real question that you can ask is why is this game so great? Holy Triforce! Where to begin? Ok, this is going to be hard for some of you to grasp, but a lot of the things we take for granted in adventure games these days didn’t exist until OoT. To this day it is still the father of so many innovations that people tend to ignore it. I won’t take too much time with this, I only want to list a few of the things that we should be thankful to OoT. 3D “open world” adventure? Yup! L-targeting your enemy? Yes! HUD button display? Hell yeah! Context-sensitive button action? Done! Side quests? Si! Awesoming everything? Indeed! Although some of these weren’t actually invented for OoT, they were perfectly amalgamated into a game and created the style we still have today. OoT managed to perfectly blend all these factors on their first try. One of the features that makes it great is that the experimentations made with it actually worked out. It could have tanked, it had so much novelties in it that gamers in general could have hated it but they didn’t, everyone loved it because it felt natural, it felt like all games should be that way, and they still are. What is has different is the time travel component that made the game’s story so innovative at the time. Until then, the story had been spent in a standard context of Hyrule or a dream land. And this one had that spin that we started with a child Link, and then we took control of a future older Link. And we could travel back and forth as we wanted, going to the past to manipulate the future. Overall this feature is great. I could discuss the full plot of OoT, but I don’t believe any gamer in 2015 doesn’t know it, and those who don’t… Play it, it’s worth every second of your time. The Legend of Zelda games, always had an excellent world building. The kingdom of Hyrule is always different but always feels the same. Be it the standard top view of the original or A Link to the Past, covered by sea, with floating islands, always familiar, always new. But it was in OoT that for the first time we saw it in all of its splendour. When you are playing OoT for the first time in 1998, you get are constantly in awe with the world, it actually looks like a balance ecosystem. We can see that Hyrule field with the Castle and Lon-Lon Ranch take centre stage. We know that everything will pass through there, it is our hub, and it makes sense as the Castle is the hub of the kingdom. Death Mountain and Zora’s domain to the right and Kakariko Village at the foot of the mountain are also logical, the “commoners” wouldn’t live in the castle but were close to each other for strategic, economic and cultural reasons. The lush Lost Woods and Kokiri Forest isolated by hills, Lake Hylia that supplies all the water of the kingdom through, and even the far distant Gerudo Valley and Desert are placed where they should. It may not look like it, but I believe that everything here was thought out to the last detail. But this is just the overworld, Legend of Zelda, and OoT in particular is known for having as much below it as above. And the dungeons are still some of the best ever made. Another standard in some Legend of Zelda games, but particularly in this one, is to return to the dungeons. Sometimes for extra items, sometimes because we could not reach something without a specific item, sometimes as in this case, time itself. Not only the dungeons, but Hyrule change in time. Younger and older Link have different perspectives of the land as in the second part everything is mostly dark and derelict, opposed to happy sunshine of the first. There are some dungeons I love in OoT, because of the way they are blended with the story. When younger, Inside Lord Jabu-Jabu’s belly is great. First of all it is inside a giant fish-god belly. Secondly we have to carry bratty Princess Ruto around which makes the puzzle solving a lot more interesting. Lastly it’s inside a giant fish-god belly! When Link is older there are so many great dungeons to visit, with so many great bosses, and although I may be expelled from TAY after saying this but the water temple is great! Just listen to me while you gather your stones and put on your fake beards, please. Yes, I am aware that it is hard, not Classic Nintendo Hard, but hard. All the going up and down, flooding and water levels, stupid metal boots, I know, I was there I did it also but if we think about it isn’t that what we love on games? That they push us just to the edge and then we conquer that push, and we have a sigh of relief when we do? Also there is something that I like about that very high compact space, filled with water that gives me claustrophobic feeling, but in a good way. I just want to get out of it. And for some reason it makes me love it even more. Look at you all grown up!